BBM for Android leaked image | BlackBerry Blast! BBM is coming to iOS and Android this year, and some screenshots have finally leaked. Why BlackBerry waited so long to open up their platform is a mystery, but it looks like they are going through with it. 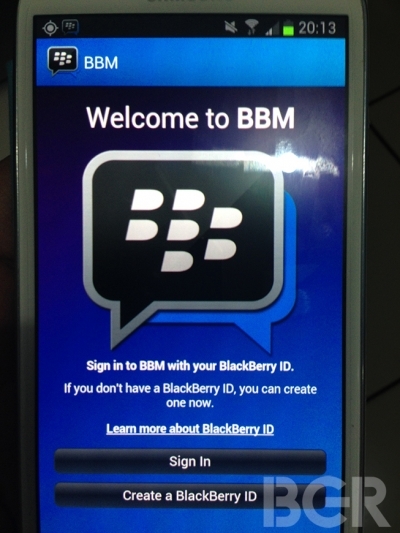 BGR posted a pic of the login screen on BBM for Android. It looks about like you would expect it to look. The app is said to run pretty well on Android. Does anyone care? Most iOS users use iMessage, and most Android users are on Whatsapp. I guess it's better late than never for BB...sort of.